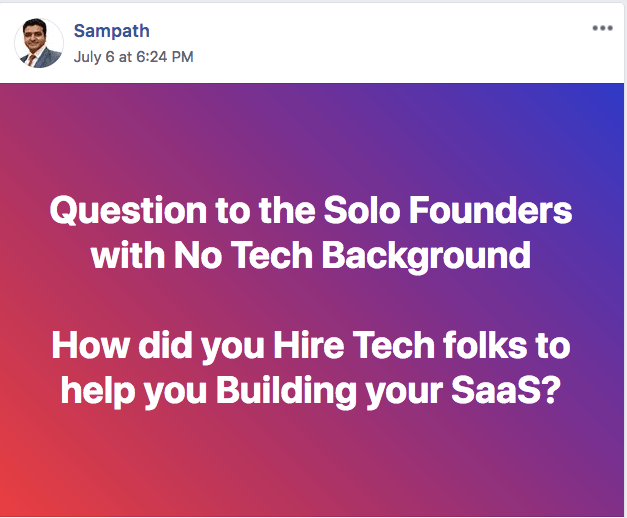 Question to the Solo Founders with No Tech Background: How did you Hire Tech folks to help you Building your SaaS? 2. Interview at least 30 developers or teams before hiring them. 3. Take at least 6 weeks to have some conversations ask questions you will learn a LOT (do not skip this), ask even dumb questions and come back to others candidates and gauge their thoughts on some of these responses and questions. 4. Find a lead developer or CTO at a great tech company and present your ideas and plans that your top 5 developers came back with…connect with him on LinkedIn tell him what you are doing and that you want to gauge his thoughts…if you have a dev friend it is even better.